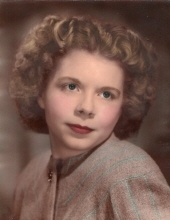 Mary Ann Creacy, 90, of River Hills Village, Keokuk, IA, formerly of Nauvoo, IL, passed away at 6:10 a.m. Wednesday, October 3, 2018. She was born on July 18, 1928 in Quincy, IL the daughter of Ralph and Ursula Dalhaus McLaughlin. On April 10, 1948 she married Charles Junior "Charlie" Creacy in Keokuk. He preceded her in death on August 7, 2009. Mrs. Creacy was a graduate of Keokuk High School. Following high school she worked at Electro Metals in Keokuk. She then owned and operated C & M Variety in Nauvoo where she enjoyed visiting with her customers. Mary was a member of the King’s Daughters and the Women’s Bridge Club. She was an excellent seamstress and was known as a hardworking woman. She was of the Christian faith. Survivors include three daughters, Carol (Daniel) Gutman of Nauvoo, Christine (Neil) Curtis of Blandinsville, IL and Cindy (Kevin) Nichols of Nauvoo, three sons, Carl (Diane) Creacy of Mt. Union, IA, Curt Creacy of Keokuk and Chuck Creacy of Olympia, WA, seven grandchildren, Christopher Flynn, Joshua Gutman, Neil Taylor, Tessa Shutwell, Jacob, Ashley Riggins and Tyler Burtalo, nine great-grandchildren, and two brothers, Marcellus and Maurice McLaughlin. Mary was preceded in death by her husband, one grandchild, Justin Burtalo, one brother, Merle McLaughlin, and two sisters, Margaret O’Neal and Marjorie McLaughlin. A graveside service will be 2:00 p.m. Sunday, October 7, 2018 at the Nauvoo City Cemetery with Rev. Mark Anderson officiating. No visitation is planned. A memorial fund has been established for St. Jude Children’s Research Hospital or the Disabled American Veterans. Schmitz-Banks & Beals Funeral Home in Nauvoo is assisting the family with arrangements. On-line condolences may be left to the family at sbbfuneralhome.com. To plant a tree in memory of Mary Ann Creacy, please visit our Tribute Store. "Email Address" would like to share the life celebration of Mary Ann Creacy. Click on the "link" to go to share a favorite memory or leave a condolence message for the family.